As part of our participation in Capture Photography Festival, Arts Umbrella students in instructors Kristen Roos’ and Alex Waber’s Fall Session Photography classes developed their skills and created works for an on-site installation at Olympic Village Station and exhibition at Remington Gallery. We spoke to one of the students, Tyrese Temple, about his experience in the class and what he’s most looking forward to as the exhibition approaches. I first became interested in photography at the age of eight. I had begun taking pictures with my mom’s camera whenever we would go out on the weekends. The scenery at Stanley Park and English Bay, as well as the character of Granville Island were some of my favorite places to take pictures. I also enjoyed taking actions shots during my sister and brother’s soccer games. How did you react when your instructor told you your work would be shown at a gallery and be part of a public exhibition at the Olympic Village Skytrain Station? I was surprised and very happy when my instructor, Mr. Roos, told me my work had been selected. I was only shooting for myself but felt really proud and overjoyed when I learned that others would be viewing my work. The exhibition at the Remington shows your process over a 12-week session. What skills did you develop in that time? In the 12-week session I gained greater knowledge of camera settings such as F-stop, light meter, ISO, and shutter speed. I also had the opportunity to experiment with composition elements such as balance, lighting, reflection, and exposure. 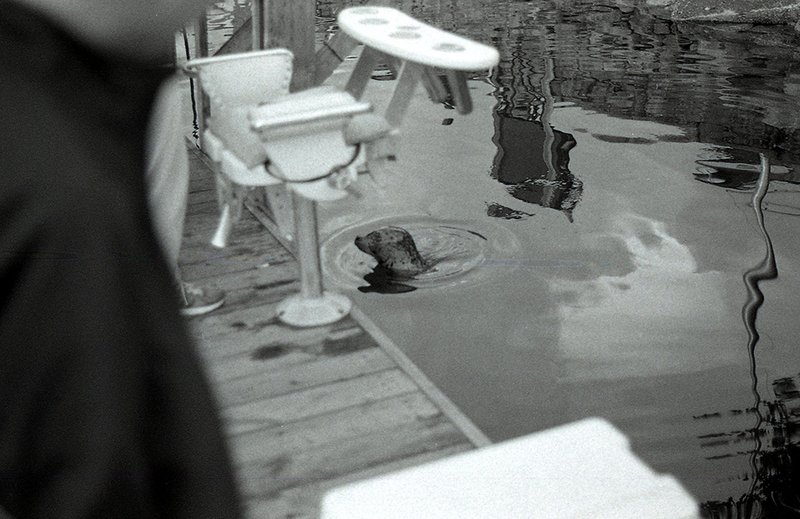 I also learned the full darkroom development process of black and white photography. What was your approach to the theme “Reflections”? 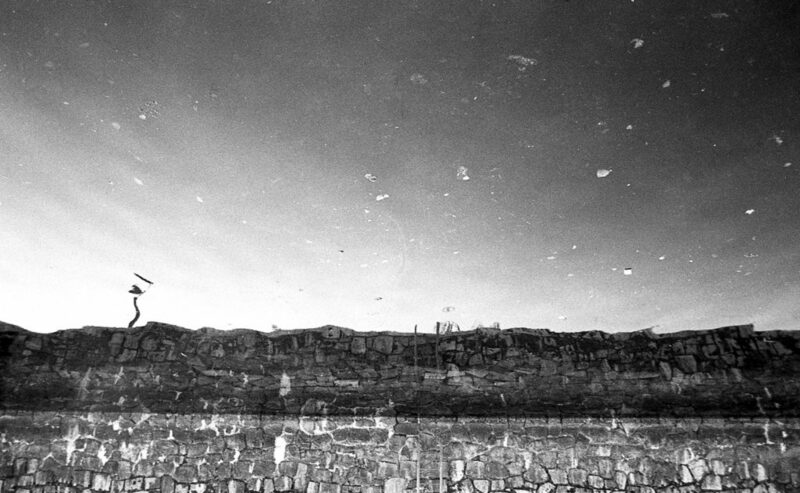 My approach to the “Reflections” theme was to find reflections in the least likely of places where the reflection itself could be the main subject of my photograph. What advice do you have for other teens interested in photography? Always carry a camera with you and pay attention to the subtle characteristics of everything in your environment. Don’t be afraid to take chances with creativity; something you might not have found inspiring could end up being the photograph you were looking for. What are you most excited for as we approach the Remington exhibition on April 6? I am very excited for my family to see my work displayed publicly and proud that my creativity will represent a small piece of Vancouver. I am also very excited to learn what I can from viewing the works of other students and artists. In Transit (2019) demonstrates the work of Arts Umbrella students working through the theme “reflections.” The installation features both darkroom and digital photography practices created by two classes of students aged 13-19 during the Fall session at Arts Umbrella. Students worked to interrupt the theme and unpack how darkroom and digital photography intersect and complement each other. For this project, student artists Maria Varbanova, Tyrese Temple, Alex Sikorsky, Bali Chu-Mehrer, Diego Minor, Andy Zhang, Chloe Nakatsuru, Grace Liu, Shutak Cheung, and Jackie Franks were instructed by teachers Kristen Roos and Alex Waber. 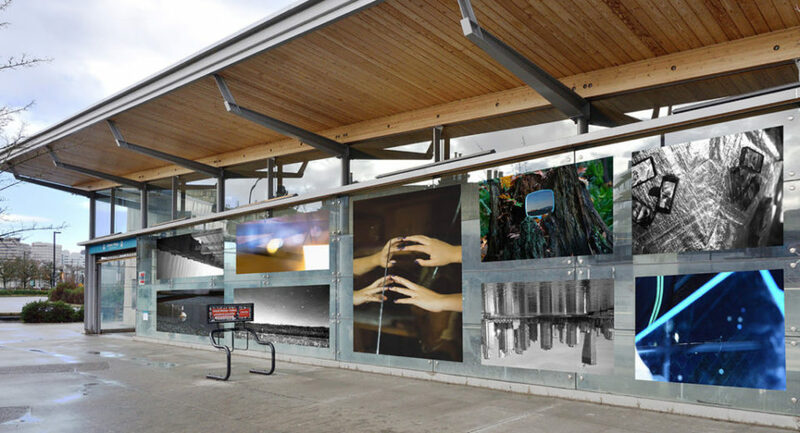 In Transit: Reflections captures the process of Arts Umbrella students creating the work In Transit, installed at Olympic Village Station as part of Capture’s 2019 Canada Line Public Art Project. The exhibition highlights each student’s individual process of experimentation, practice, and discovery throughout the Fall 2018 session. Kristen Roos is a Vancouver-based artist whose practice includes site-specific installations, sound design for dance, and performance. He holds a BFA from Concordia University and an MFA from the University of Victoria, which focused on a series of site-specific micro radio broadcasts (published in Islands of Resistance). He has received funding for numerous projects through the Canada Council for the Arts, a Mayors Arts Award for a live work artist residency with the City of Vancouver in 2010, and a People’s choice award for his Ghost Station installation at Nuit Blanche Toronto in 2007. Alex Waber is a portrait, commercial, and fashion photographer based in Vancouver. A graduate of the Capilano University Cinematography program, he takes his knowledge of visual storytelling and applies it to still photography. His images have been published internationally in publications like Rolling Stone, The Guardian, Homes and Living and Montecristo. While his primary focus is fashion photography and portraiture, he produced fine art photographs that have been exhibited in several galleries around Metro Vancouver. Launched in 2013, the annual not-for-profit Capture Photography Festival is Western Canada’s largest lens-based art festival. Each April, photography and lens-based art is exhibited at dozens of galleries and other venues throughout Metro Vancouver as part of the Exhibition Program, alongside an extensive Public Art Program, a youth-oriented Learning Program, and an Events Program that spans tours, films, artist talks, and community events. Festival Dates: April 3-30, 2019 at various locations around Metro Vancouver and Whistler.